The inside of a lock or a door knob consists of a lock cylinder. Most of the locks for houses operate with this system. It works with pins arranged on a certain sequence that works with accordance with the pattern on a key. This way, the door lock can only be opened if you use the right key. If you are choosing this type of lock for your home, you should understand the benefits and downsides of lock cylinders. A wafer tumbler lock has flat rectangle-shaped disks instead of pins with blunt edges. The key to a wafer tumbler lock has a zigzag shape with sharp edges. A disc tumbler lock has rotating discs inside of it that can be opened with a specifically cut key. The disc tumbler lock uses no spring and is most suitable for outdoors because it is more durable and harder to lock pick. Lock Cylinders are easily rekeyed. When you want to change the key of a door that uses cylinder locks, you only need to replace the pins inside of it. It does not even require the mastery of a locksmith, you can do it by yourself. This can be done in several easy steps. You only need to unscrew the knob, take out the cylinder lock and exchange your old pins with new ones. In a building with a lot of tenants, such as an apartment, the landlord or landlady should own a master key in case of emergency. If you rent out your multi-bedroom house to other people, you should also create one. A master key can be used to open all of the doors in an apartment, while the keys of each tenant can only open their own doors. Cylinder locks can be set to allow a second mechanism that can be opened by one master key. You can also set up a master key if you want all the doors in your house to be opened with one key, to avoid the trouble with a lot of keys. Available in single/double cylinder locks. You have a choice to use either a single or a double lock. o	A single lock means the door can only be locked one-way: you need a key to enter but no key is needed to exit, only a twist of the doorknob or a pull of the handle. o	A double lock is the more secure of the two. To prevent burglary in a house, people install a double lock so that burglars cannot enter a house through the window and open the door from the inside. 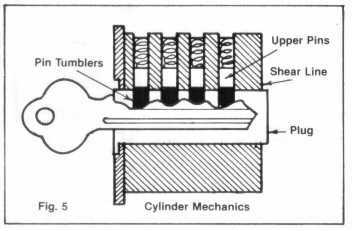 A double lock uses two cylinders, because a key can only be inserted through one side of a cylinder. With the installation of a double lock, you will need a key to both exit and enter a house. Whatever lock you decide to choose, there will always be things to look out for. In the case of lock cylinders, it is the dangers of lock picking and lock bumping. Using cylinder locks can make you more prone to them. Using an unbent paperclip or a wire, a lock pick can reach the insides of a keyhole and manipulate the pins inside of a cylinder lock. The door can be opened if they arranged it to be the same position as when a key is used. A bump key is a specially crafted key used to lock pick. When a bump key is inserted into a key hole and pushed inwards, the momentum has the pins (which are connected to springs and therefore elastic) go upwards. In this very short time, the cylinder can be turned and thus opening the door. You can reduce the risk of lock picking and bumping by investing in good quality cylinder locks. Do not buy the cheapest locks in a local hardware store. Instead have a certified professional advise you on the best options for your situation. Need advise or lock installation? Dail (866) 670-3266 We will gladly offer you expert advise.